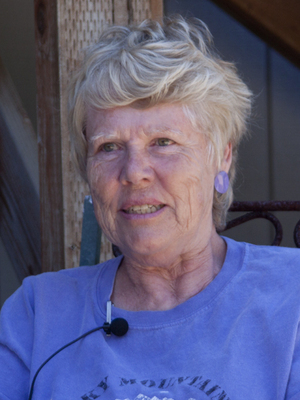 This photograph of Donna Ludwig Peterson was taken during an interview that was collected as part of the Launching through the Surf: The Dory Fleet of Pacific City project. For an additional storyteller image, refer to Donna Ludwig Peterson 02. For an additional storyteller image, refer to Donna Ludwig Peterson 03. For an additional storyteller image, refer to Donna Ludwig Peterson 04. Launching through the Surf: The Dory Fleet of Pacific City is a collaborative project involving the Linfield College Department of Theatre and Communication Arts, the Jereld R. Nicholson Library, the Linfield Center for the Northwest, the Pacific City Arts Association, and the Pacific City Dorymen’s Association. The collaborators and project partners thank Dave Larkins of Pacific City, who has served as the Dorymen’s Association liaison for the project, their Linfield colleagues who have provided assistance, and the individuals who graciously shared their stories and memorabilia for inclusion in this historical collection. Support for the project has been provided in part by the following: two grants from the Keck Community Engaged Research to Classroom Program from the Linfield Center for the Northwest, five Linfield College Summer Student-Faculty Collaborative Research Grants, an Arts Build Communities Grant from the Oregon Arts Commission, grants from the Yamhill County Cultural Coalition and the Tillamook County Cultural Coalition, a Cultural Development Grant from the Oregon Cultural Trust, and generous gifts from Nancy Whelan and an anonymous individual donor. Rhianna Bennett, Mary Beth Jones, Gabrielle Leif, and Alicia Schnell have assisted with preparation of materials for the archives. Marshall, Tyrone, "Donna Ludwig Peterson 01" (2012). Storyteller Photographs. Image. Submission 75.